Dr. Jeff Stott, UC Cooperative Extension Professor of Pathology, Microbiology & Immunology at UC Davis, recently gave a talk on foothill abortion at a producer meeting in San Luis Obispo County. Click this link to see his PowerPoint presentation: http://cesanluisobispo.ucanr.edu/files/267719.pdf. For those of you who were not able to attend, I summarized some great information from his talk below. Foothill abortion, also called Epizootic Bovine Abortion (EBA), affects cattle in California, Nevada and Oregon. It is caused by a bacterium that is vectored by the Pajaroella tick. These ticks occur in areas with sage, bitter brush, pinyon pines, junipers, and oaks. Unlike more commonly known ticks that crawl up grasses and brush and wait for an animal to walk by, Pajaroella ticks live in the duff on the ground. They are attracted to carbon dioxide. So, when cattle are bedding down in the duff under oak trees or near bitter brush, ticks will come out of the duff and feed on the animal. They only feed for 15-20 minutes then fall off the animal and go back into the duff. 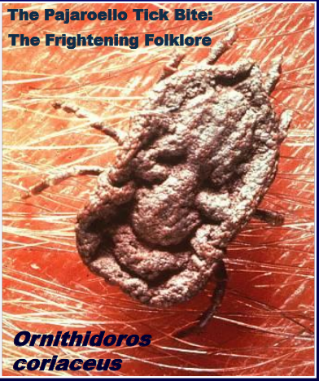 Pajaroella ticks are believed to be able to live up to 10+ years. They tend to occur in dry rangeland, not in moist areas like irrigated pastures, and are most active during warm weather, May through October. However, they can be active during other months if they are unusually warm. The foothill abortion bacterium can cause fetal mortality. The bacteria live in the uterus for 30-40 days. So, if you breed animal during that time, 3-4 months later she'll abort, cycle back and re-breed. The bacterium can also cause term abortions or weak calves. Heifers and cows are susceptible to foothill abortion if they get bit 30 days prior to conception to 150 days after conception. If they are exposed before or after this time they will probably not be affected. If an animal is infected as late as 5 months into gestation, she will likely give birth, but her calf will be weak. Signs of foothill abortion are not visible in the fetus until approximately 100 days after infection, meaning that, for example at day 90 after being infected the fetus will still appear to be fine, but by day 100 signs will be visible. On an aborted calf you will see red dots on eyes and mouth. It will also have a swollen belly because it is full of fluid. Lymph nodes in front of the shoulder will be enlarged. The thymus (sweet breads), instead of being white, will be red from hemorrhaging. You will also see an enlarged spleen and mottled liver. Ranchers can lose up to 90% of their calf crop when unexposed cows are brought into a new area and are exposed to the tick for the first time. The University of California has been doing vaccine trials since 2009. The vaccine is a live bacteria vaccine. 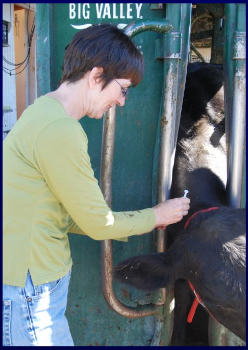 By 2017 more than 23,000 heifers were vaccinated. Results show that the vaccine is more than 90% effective with immunity lasting for a minimum of three years, even if the animal is not exposed to the tick during that time. A tick bite acts like a booster, so animals that live in foothill abortion country will continue to be immune after the vaccination wears off because they are likely to be exposed to the tick within a year or two. You can vaccinate calves as soon as you know you're going to keep them as replacement heifers. But, the foothill abortion vaccine should not be given to pregnant females or those who will be bred within 60 days after vaccination. Animals vaccinated during that time period may lose the fetus. Foothill abortion has only been documented in California, Nevada, and Oregon, so it has been difficult to get a company to produce the vaccine. However, cattlemen in foothill abortion areas have been vocal for a long time and because of that we are now getting closer to having a vaccine commercially available. I just had a calf born 37 days early it is weak and wobble i believe its foothill abortion? what can i do for the calf? We have had 78 cows abort when preg,d in Nov.2018 and several since. Yesterday and today we had 2 cows have very small,40 lb calves. One of these calves has his tongue out. I think they are a result of the foothill disease. Is there any thing we can do to help them. Will they grow to normal size or should they be euthanized. How can I obtain the vaccine? Have there been any trials on mature cows in between breeding? I checked in with the folks at UC Davis about your questions. They said the vaccine is not yet available commercially. They hope it could be on the market sometime in 2020 but they don't really know since they aren't the ones producing it. Unfortunately, the trial remains closed to new producers. Regarding vaccination of mature cows; yes that can and has been done. The problem is that there must be a 60-day window between vaccination and breeding, which may be impractical for many producers. The interval is required for the heifer/cow to clear the bacteria and those that “cheat” on that interval may experience a high percentage of early fetal losses. This can be >25% at 30 days post-vaccination and probably much higher if they reduce the interval to 2 – 3 weeks.